In the New Testament we see multiple warnings about deception. What is deception? Deception is the act of causing someone to accept as true or valid what is false or invalid. 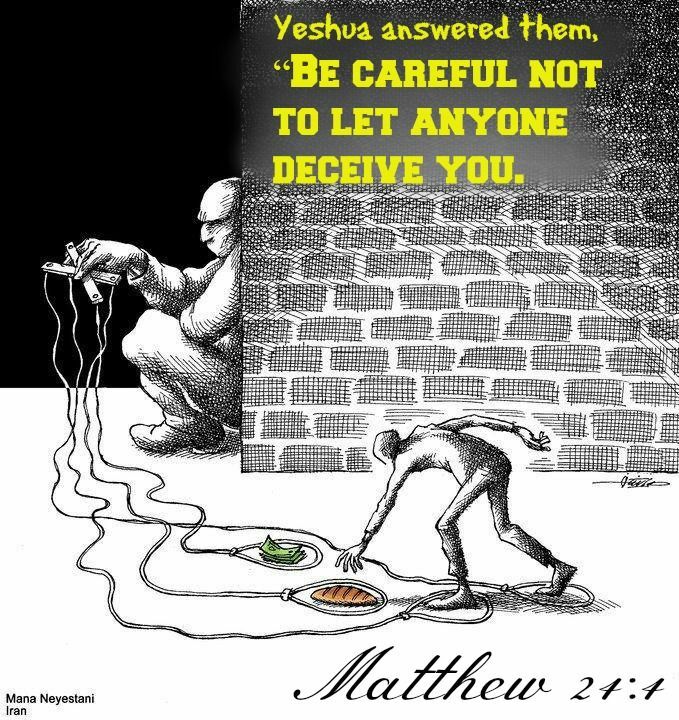 Here are some examples of the warnings issued to Believers in Yeshua about deceivers who would try to pull them off of the path chosen for them by God. Ephesians 5:6: Let no one deceive you with empty words, for because of these things the wrath of God comes upon the sons of disobedience. 1 Corinthians 15:33: Do not be deceived: “Bad company corrupts good morals. Colossians 2:8: See to it that no one takes you captive through philosophy and empty deception, according to the tradition of men, according to the elementary principles of the world, rather than according to Christ. 1 John 3:7: Little children, make sure no one deceives you; the one who practices righteousness is righteous, just as He is righteous. Jesus, Himself, issued warnings about deception when His Disciples asked Him about His 2nd coming and the Last days. Mark 13: 5 And Jesus began to say to them, “See to it that no one misleads you. 6 Many will come in My name, saying, ‘I am He!’ and will mislead many. Matthew 24:4 And Jesus answered and said to them, “See to it that no one misleads you. 5 For many will come in My name, saying, ‘I am the Christ,’ and will mislead many. Why are there so many warnings about deception in the New Testament? Was Jesus saying that people will literally call themselves “Jesus” or the Messiah, or is He saying that deceivers will say that they “speak for him”, and yet purposefully mislead the flock (followers of Jesus/Church)? Could Jesus also be speaking of deceivers who would present themselves to people as “Good”, kind, benevolent, virtuous and then get people to believe in or follow after wrong thinking, attitudes, or actions? The Bible calls these people devils who masquerade as angels of light. But wouldn’t we be able to easily “see through” their deception? Hmmm…maybe it’s not so easy. Revelation 12:9: And the great dragon was thrown down, the serpent of old who is called the devil and Satan, who deceives the whole world; he was thrown down to the earth, and his angels were thrown down with him. Even during the days of the Disciples (book of Acts) and on into the early Church, the “mystery of Lawlessness” was already at work, working behind the scenes. What is meant by “lawlessness”? The definition is fairly simple. It means a state of disorder due to disregard of the law. What laws are we talking about? We’re talking about God’s Laws. The New Testament makes it clear that those who believe in Jesus are under Grace, and our sins have been forgiven; however, it’s also pretty clear that GRACE offers us freedom FROM sin, it does not grant us a “license TO sin”. What is sin? Sin is law-breaking, commandment breaking. God gave us 10 commandments, Jesus boils them down to two, and instead of giving us a list of “Don’t do’s…He turns them around and gives them a Positive spin of what “to do”…or LOVE. Mark 12:30: Love the Lord God with all your heart, mind, soul and strength and love your neighbor as yourself. If we love our neighbor, we won’t steal from them, covet their stuff, murder them, commit adultery against them, etc. If we Love God, we won’t take His Name in vain, we won’t set up idols to worship, etc., See? But in the last days, there will be a strong delusion on the land so that what is good will seem evil and what is evil will seem good. How do we know this? 2nd Thessalonians 2 tells tells us that God will send people a strong deluding influence. What does this mean? God does not deceive, but He will ALLOW a deluding influence to be very prevalent to separate the sheep from the goats, the wheat from the chaff. God is allowing this deluding influence so that those who take PLEASURE in WICKEDNESS and who DO NOT, and absolutely WILL NOT BELIEVE the TRUTH, will be separated. God is separating the sheep from the goats. Jesus Himself tells us in Matthew 24 that this strong deluding influence will be so seductive, will seem so “good” that it will deceive even the very elect if that were possible. The “elect” may be referring to God’s people, particularly the Jewish people who will be here in the last of the last days. 2nd Thessalonians 2: 11: For this reason God will send upon them a deluding influence so that they will believe what is false, 12 in order that they all may be judged who did not believe the truth, but took pleasure in wickedness. What is this “strong delusion, or deluding influence? ?” Matthew 24 tells us that the strong deluding influence will include “lying signs and wonders”; (aka false Miracles), and I don’t think that we’ve seen that yet. However, it’s likely that we are already seeing the “build-up” to it even now. We know that the “mystery of lawlessness” has been at work for a long time (2000+ years), and continues to build in strength and power. What can we do to be “not deceived”? Ask Holy Spirit to illuminate truth and to show us deception (Holy Spirit has been sent to Believers in Yeshua to guide them and lead them into all truth (John 16: 13-14). Love and Trust in Jesus Christ and desire to please Him. Jesus saved us at the Cross so our “good works” do not save us; however, we should be grateful for His Sacrifice and always desire to please Him by Keeping His Commandments as best we can. Keep in mind that the enemy of mankind is the prince of the power of the air and his main goal is to deceive mankind; therefore messages that come through the news, government institutions, public education, entertainment, music, etc that do not line up with the Word of God, should not be considered truth. (Example, the media and government officials may tell us that abortion is a women’s right to choose, that it’s a women’s health issue and those who are against abortion are “right wing activists”. But the Bible, which is THE ONLY Truth, not “a supposed truth or someone’s opinion” tells us that God knit us together in our mother’s womb. To God, abortion is murder, child sacrifice, a type of baal worship. Do not be deceived, the enemy is the prince of the power of the airways and his purpose is to deceive mankind thus dragging mankind into the pit with him. What are some “red flags” for deception? How will we recognize false prophets, false teachers, false “goodness”? The Bible tells us that we will know false teachers and deceivers “by their fruit”. A good tree cannot bear good fruit and a bad tree cannot bear bad fruit (Matthew 7: 15-20). Christians have to be fruit inspectors. What is bad fruit? Law breaking and/or teaching others to do the same would be a bad fruit. Many false teachers will build up for themselves wealth, power, status while asking their followers to do without. They often elevate themselves over the flock. False teachers will often preach a false doctrine such as “Prosperity Gospel” (aka God wants you to be RICH). A false teacher might advocate a works based religion, meaning you have to be work, give, or be perfect or you have no path to Heaven. Another type of false teacher might even imply that the God of the Old Testament is not the God of the New Testament, or that God has changed His mind about certain behaviors He called sin, well, run from them as God says that He changes not….ever. God is the same yesterday, today, and forever. We are the only ones who change. However, we should also always remember that God loves sinners and that we are all sinners. Jesus came to save us from our sin. A false teacher may teach that there are many paths to Heaven, one example of this is the “Coexist” movement, or even parts of the Ecumenical movement. Some false teachers teach that the Muslim, Christian, and Jewish God is the same God. This is actually what they are teaching our children in the Public Schools. This is not true. Although it is true that the Jewish and Christian God (YHWH) is the same God, the Orthodox Jewish person does not YET recognize that Yeshua (Jesus) is the PROPHESIED Messiah for whom they are still waiting. They missed the time of their visitation. The Muslim god is not the same God at all, and is really baal from the Bible. The real truth is that there is only one path to Heaven for ALL people..and that is through the Son of God, Yeshua Hamashiach, Jesus the Messiah. Jesus, HIMSELF, gave us another clue as to who may be a deceiver and who may be sent by God. However, there are always exceptions to any rule, so we have to pray for discernment and seek the Holy Spirit for Revelation. This is really an important concept and will be even more important as we move forward in time towards the unveiling of the antichrist, the individual who will appear to the world as a type of “savior”. Make no mistake, this individual WILL NOT be wearing a LABEL of antichrist because the devil is FAR more subtle and cunning than that! John 15: 18 “If the world hates you, you know that it has hated Me before it hated you. 19 If you were of the world, the world would love its own; but because you are not of the world, but I chose you out of the world, because of this the world hates you. Let’s apply Jesus’ Words to the time we now live. 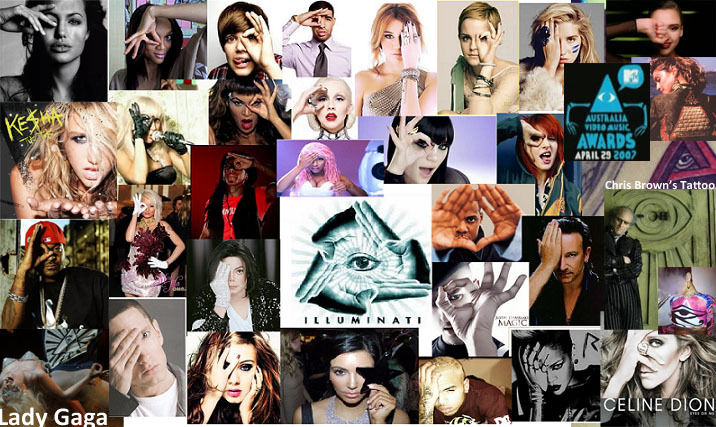 I find that a very good barometer happens to be the entertainment industry (as a whole/not individuals) because this industry is “riddled” with Illuminati satan worshippers and therefore makes a very good example of what Jesus meant by “the world”. So if “the world” (aka the entertainment industry as a whole) “loves” an individual (President, Monarch, religious figure, authority figure, then there is a good chance that this “someone” was sent (by satan) to deceive. But if the world (particularly the godless entertainment industry) hates an individual, then there’s a good chance that “someone” was sent by God, possibly even to expose evil. Satanism is rampant in the Entertainment Industry. Our prayer is for everyone who sets their eyes upon this blog, and for even more people than this, to have their eyes and ears opened and sharpened and be ready for this Great Delusion that is coming upon the land, and really, is already here in the “mystery of lawlessness” that is currently at work. Be careful who you believe. Everything is not always as it seems and those who are demonized and hated by the media, by the entertainment industry, and by the world may just be the ones whom God has sent to expose the evil that goes on behind the scenes. By contrast, the ones who sound really good in front of the camera, who are “media darlings”, who speak words that “tickle our ears” may be sent by the enemy to deceive. 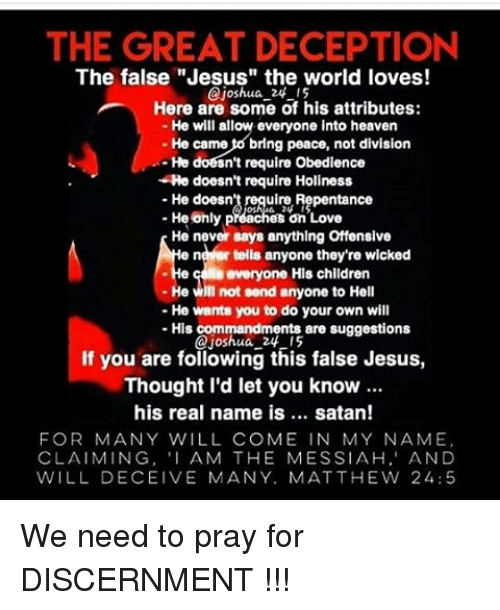 There is Deception on the land, and only the Words of Jesus can keep us from falling for the Great Deception that is ever increasing and growing on this earth until it culminates with the unveiling of the anti-christ who will be loved by most people, and who will be pushing the mark of the beast. Professional journalism or scripted propaganda?